Dublin City Council has published a proposal to redesign the cycle route from Clontarf to Amiens St. This is the main route to the city centre for residents of the Howth/Malahide ward. The previous time they did a redesign in this area for a quality bus corridor in 2006 they failed to design safely for cyclists. Unfortunately they have come up with another unsafe design. BICYCLES AND BUSES SHOULD NOT BE MIXED. This is the busiest arterial cycle route in Dublin, with over 1400 cyclists and over 200 buses crossing Newcomen bridge southwards in the morning peak. 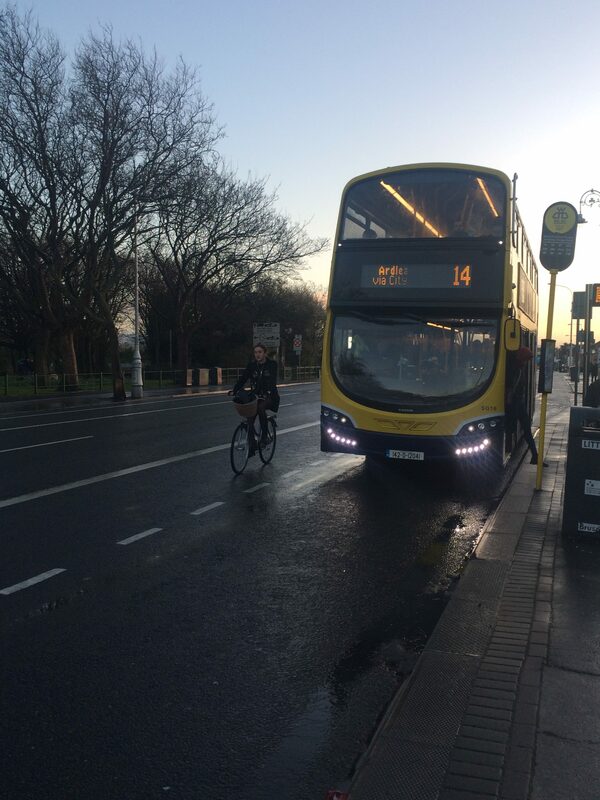 The proposed design means buses would continue to pull across the cycle lane to reach the bus stops. This is bad news for both cyclists and bus passengers. We believe the design should be suitable for cyclists of all ages and abilities. This means `island` bus stops. FAIRVIEW’S STREET TREES SHOULD BE SAVED. The proposed design involves the removal of all of the footpath trees in front of Fairview Park, over 50 mostly mature trees. There is plenty of space in Fairview for a good design without felling these valuable trees. SPACE SHOULD BE TAKEN FROM THE ROAD NOT THE FOOTPATH. Because of a decision to maintain multiple traffic lanes, space will be taken from footpaths for the design. This makes no sense when there is less space for cars in the City Centre and the official goal is to favour walking and cycling. 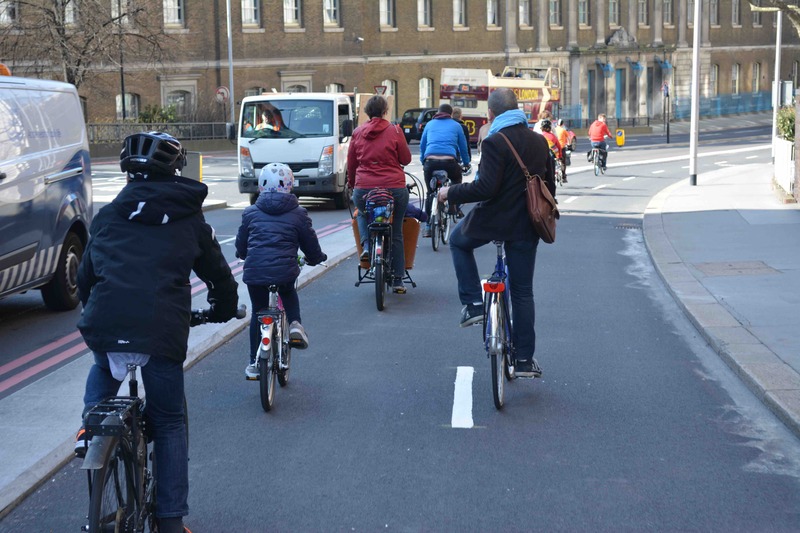 The design should prioritise walking, cycling and public transport because these move the most people along the route. JUNCTIONS MUST BE SAFE FOR WALKING AND CYCLING. The design proposes some real improvements to junctions. 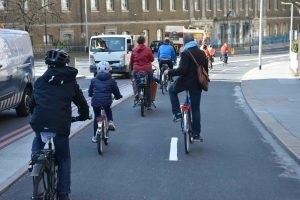 However other pedestrian crossings and cycle facilities have been ruled out because the required traffic signal timings would reduce capacity for cars through the junctions. Designing for pedestrians’ and cyclists’ safety should be the first priority. Further information on the proposal is here. If you agree with these points, please make your views known to Dublin City Council, Block 4, Floor 3, Civic Offices, Wood Quay, Dublin 8 traffic@dublincity.ie before 16:30 on 9th March 2017. Fingal County Council has agreed to make a submission following a motion I raised at the Howth/Malahide Area Committee. This entry was posted in Transport / Taisteal, Walking & Cycling / Siúil & Rothaíocht on February 28, 2017 by david. A proposal for a new junction at Hole in the Wall Road / Mayne Road is on public display until 9th March. As discussed at the Area Committee, i would like to see alternative options for junction design being considered at this location. In particular, the design set out in this video has a lot to recommend it in terms of safety. I have used junctions like this and found them much better than the design proposed. It’s quite a simple proposal but I particularly urge anyone who cycles or walks on these roads to have a look at contribute their comments. This entry was posted in Baldoyle / Baile Dubh Ghaill, Clonshaugh / Cluain Seach + Belcamp, Portmarnock/Port Mearnóg, Transport / Taisteal on February 28, 2017 by david.